A solid partnership with a reseller can create enormous opportunities for your organization, but building such a relationship requires strategic decision-making and considerable effort. While the process of building a partner program will look slightly different for every company, I’ve pulled together a few universal tips for recruiting and activating partners in your network. Define your company’s ideal partner profile. To avoid wasting time recruiting and working with the wrong organizations, take some time up front to define the attributes of the partners you want to accrue. Get started by looking at what has worked in the past – make a list of your most successful partners and dig into what has made the partnership a good one for your company, whether it’s geographic coverage, time the partner has been doing business, types of people who the partners sell to, etc. Once you have the profile defined, be sure to recruit against that profile. Consider their readiness to partner. One metric I’ve learned to consider over the years is a company’s revenue curve related to time. When you look at the amount of time a potential partner has been in business, you may see the organization has had a very successful buildup of revenue associated with the technology they’ve been focused on so far, such as early stage business intelligence or networking. But then you may see a plateau. This is, to me, a very attractive time to consider approaching a firm about a partnership. That partner may be looking for the next wave to catch and your technology could represent the next chapter of growth. A partner in that stage of its growth will be focused on your solution and invested in your mutual success. 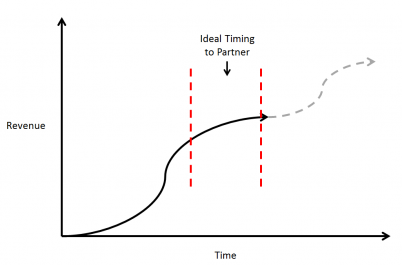 Consider your own readiness to partner. Companies often assume that if they can find and sign the right partner, a productive and profitable relationship will take off effortlessly. You need to take a step back before you even start the process to assess and evaluate your own internal readiness to partner effectively. Make a checklist. Do you have enablement materials from both a technical perspective and a selling perspective? Are your materials available and ready for distribution? Do you have a partner portal where your partners can gather information and learn on an ongoing basis? What’s your go-to-market readiness – if a partner is signed up, are you actually ready to start selling? Remember, it’s a partnership. You can’t just be ready to take, you have to give too! Create a “Partner Gravity Well.” This means making an effort to create buzz or inbound interest around your partner program. We regularly promote our Core Secured™ Partner Program on social media, on our website and at industry events. We also have a partner portal for resources and developed a partner alias so that anyone looking for more information can launch specific inquiries that are immediately routed to the right people in our organization. By taking advantage of our Partner Gravity Well, we field approximately one or two inbound inquiries per week from potential partners who would are looking to work with us on a global level. By making strategic decisions at the outset, you’ll save a great deal of time, both for you and potential partner organizations. For more information about the Core Secured™ Partner Program, please visit us at http://www.coresecurity.com/partners.